Originally published in California Health Care Foundation. Despite the availability of new ways to treat millions of people trapped by addiction to opioids, the news has not been good. “The epidemic of deaths involving opioids continues to worsen,” said Tom Frieden, director of the US Centers for Disease Control and Prevention in response to new data that show the death toll from opioids continued to climb in 2015. People are dying despite evidence-based addiction treatment that works. Medication-assisted treatment (MAT) combines drugs with counseling to help people with opioid use disorders break the cycle of addiction. MAT can dramatically reduce the risk of overdose death. After the approach was widely adopted in France, overdose deaths declined by nearly 80%. The chief obstacle to reducing overdoses is that most people with addiction can’t access the treatment (PDF) they need. Barriers include a broad lack of understanding about the benefit of MAT in the general public and the medical community, insufficient numbers of clinicians authorized to prescribe the treatment medications, and the overpowering stigma surrounding the disease of addiction. Buprenorphine and methadone are the two medications with the strongest evidence of benefit (PDF): saving lives, decreasing incidence of HIV and hepatitis C, reducing criminal activity, and increasing recovery rates. But while methadone can only be dispensed in highly structured clinics, buprenorphine can be prescribed by primary care doctors from their own offices and managed by patients at home. Buprenorphine is covered by Medi-Cal without prior authorization, meaning patients can go to the pharmacy with a prescription and have it filled immediately. Privately insured patients and their doctors often find more hurdles in getting the treatment. A recent survey by the California Society of Addiction Medicine found almost two out of three addiction specialists have difficulty getting MAT for their patients with commercial insurance. Both buprenorphine and methadone work by calming the addicted brain’s craving for opioids and laying the groundwork to reestablish the brain chemistry needed for learning, planning, and human bonding. Because buprenorphine is a “partial agonist,” its potential for misuse is much lower than for other opioids like heroin or oxycodone, and it doesn’t produce euphoria or stop breathing. 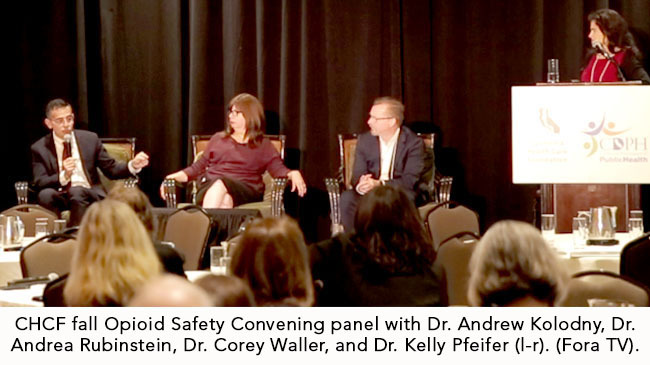 Increasing access to MAT was one of the key topics at the California Health Care Foundation’s two fall convenings of 17 opioid safety coalitions, which are working to turn the tide of the opioid epidemic in 24 counties across California. The meetings featured nationally known addiction experts like Andrew Kolodny (video)and Corey Waller (video), as well as local coalition leaders. All shared their challenges and successes. Trotzky-Sirr, who is championing the use of MAT at LAC + USC, emphasized the importance of moving from stigma to science. She is working to ensure that physicians treat uncontrolled addiction like any other chronic disease — stabilize it, then connect the patient to ongoing care. Patients addicted to opioids are going to be seen anyway, she points out, and often they are blamed for their condition. MAT offers an effective treatment option. Dr. Andrew Herring, an emergency physician at Oakland’s Highland Hospital, sees an opportunity for emergency departments (EDs) to extend their scope beyond crisis care. His vision is for EDs across the country to help individuals addicted to opioids start down the road to recovery — with MAT as their first step. One obstacle to Herring’s vision is the paucity of physicians trained to prescribe buprenorphine. In order to prescribe the drug, physicians must complete an eight-hour course to obtain permission (also known as being “waivered“) from the US Drug Enforcement Administration (DEA). In California, only 550 of the state’s 100,000 actively practicing doctors have obtained this permission. Lack of training, misunderstandings about addiction, paperwork requirements, and fear of failure make many physicians reluctant to use MAT in primary care settings, said Dr. Gary Tsai, medical director of Substance Abuse Prevention and Control at the Los Angeles County Public Health Department. Negative attitudes and misinformation about MAT contribute to these fears, although increased media attention to the opioid epidemic and growing public understanding that addiction is a brain disease have chipped away at the common misconception that MAT is just replacing one opioid with another. Tsai recommended that physicians start prescribing buprenorphine by treating less complex patients before taking on complicated, vulnerable patients. Early success helps physicians get more comfortable with treating addiction, Tsai said. Increasing the number of prescribers is key to expanding access to MAT. Under the Comprehensive Addiction and Recovery Act signed by President Obama in July, buprenorphine prescribing privileges were expanded to physician assistants and nurse practitioners who complete 24 hours of training. The curriculum is expected in 2017. Katie Dolezal, a nurse practitioner in Drug and Alcohol Services for San Luis Obispo County, is eager for the training. She is part of a team that has treated 1,000 people with MAT over the last 10 years. At the opioid convening she emphasized the importance of a whole-person care model — buprenorphine, counseling, case management, and referrals to social services like vocational training and food assistance. Dolezal has been working to offer MAT to inmates at the county jail. In the first two weeks after release, inmates addicted to opioids are nearly 130 times more likely to die from overdose than the general population. MAT can dramatically decrease these post-release mortality rates. An Australian study of 16,500 peoplereceiving buprenorphine or methadone in prison from 2000 to 2012 showed MAT reduced the one-month post-release death rate by 75%. MAT in correctional facilities remains rare in the US even though existing programs have seen success. Rikers Island Correctional Facility in New York City has been successfully treating addicted inmates with methadone since 1987. Nearly 80% of inmates (PDF) who went through Rikers’ MAT program continued to seek addiction treatment after release. Closer to home, a MAT pilot program through the Sacramento County Sheriff’s Department cut recidivism rates by more than half. But San Luis Obispo County will have to wait for MAT to be provided in the jail. At present, Dolezal does not have the funding to provide buprenorphine to inmates. Dolezal is undaunted. Twenty years working in addiction treatment has made her one of the biggest local advocates for MAT, and she is encouraged by the progress she has seen in her community.